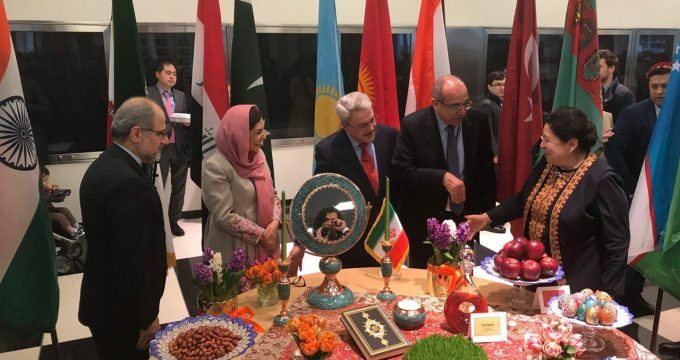 IRNA – The countries celebrating Nowruz in a different act held a food festival in the United Nations. As the coordinator of the program, Iran mission in the United Nations suggested holding food festival instead of boring and repetitive speeches. Speaking to IRNA, Ali Hajilari, secretary of the festival said the event indicated that despite cultural differences between countries, food tastes of countries celebrating Nowruz are the same. This, he said, indicates integration of these countries. Referring to participation of Afghanistan, Azerbaijan, India, Kazakhstan, Kyrgyzstan, Iraq, Iran, Pakistan, Tajikistan, Turkey, Uzbekistan and Turkmenistan in the festival, he said the event is aimed at presenting Nowruz culture. In addition to food, every country displayed a cultural video clip, Hajilari noted.